In our Gospel reading the Sunday (Matthew 13:24-43), Jesus explained three aspects of the kingdom of heaven. These parables draw on knowledge of the knowable to explain the unknowable. The first parable helps explain why God permits good and evil to exist alongside each other. The second is an understanding of how the Church could grow so large from such a small group of believers and how our tiny faith can lead us to heaven; and the third parable is an example of how even a small amount of faith, or the smallest good deed (yeast) can transform our lives and the world. Jesus proposed another parable to the crowds, saying: "The kingdom of heaven may be likened to a man who sowed good seed in his field. While everyone was asleep his enemy came and sowed weeds all through the wheat, and then went off. When the crop grew and bore fruit, the weeds appeared as well. The slaves of the householder came to him and said, 'Master, did you not sow good seed in your field? Where have the weeds come from?' He answered, 'An enemy has done this.' His slaves said to him, 'Do you want us to go and pull them up?' He replied, 'No, if you pull up the weeds you might uproot the wheat along with them. Let them grow together until harvest; then at harvest time I will say to the harvesters, "First collect the weeds and tie them in bundles for burning; but gather the wheat into my barn."'" He proposed another parable to them. "The kingdom of heaven is like a mustard seed that a person took and sowed in a field. It is the smallest of all the seeds, yet when full-grown it is the largest of plants. It becomes a large bush, and the 'birds of the sky come and dwell in its branches.'" He spoke to them another parable. "The kingdom of heaven is like yeast that a woman took and mixed with three measures of wheat flour until the whole batch was leavened." All these things Jesus spoke to the crowds in parables. He spoke to them only in parables, to fulfill what had been said through the prophet: I will open my mouth in parables, I will announce what has lain hidden from the foundation of the world. then, dismissing the crowds, he went into the house. 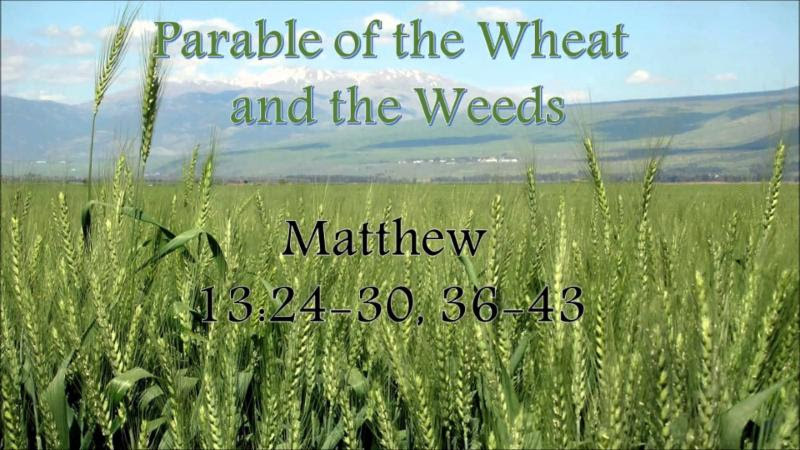 His disciples approached him and said, "Explain to us the parable of the weeds in the field." He said in reply, "He who sows good seed is the Son of Man, the field is the world, the good seed the children of the kingdom. The weeds are the children of the evil one, and the enemy who sows them is the devil. The harvest is the end of the age, and the harvesters are angels. Just as weeds are collected and burned up with fire, so will it be at the end of the age. The Son of Man will send his angels, and they will collect out of his kingdom all who cause others to sin and all evildoers. They will throw them into the fiery furnace, where there will be wailing and grinding of teeth. Then the righteous will shine like the sun in the kingdom of their Father. Whoever has ears ought to hear." Our first reading (Wisdom 12:13,16-19) is an ancient Jewish prayer to God. In it is the expression of the belief in God's power, yet God's clemency and the example we are to live by. As God is just yet kind, so must we be. In our Epistle reading (Romans 8:26-17), St. Paul reminds us that in our weakness and inadequacy of prayer, the Holy Spirit joins with us in our efforts and intereceds for us on our behalf. Brothers and sisters: The Spirit comes to the aid of our weakness; for we do not know how to pray as we ought, but the Spirit himself intercedes with inexpressible groanings. And the one who searches hearts knows what is the intention of the Spirit, because he intercedes for the holy ones according to God's will. It is through such prayers as our first reading that we can express to God our reverence and our trust, knowing that the Holy Spirit joins us in our prayer and intercedes on our behalf. We also know that, through the parables of Jesus, even the tiniest effort can transform us and can grow to immense proportions. And as for the evil among us existing along with the good? Perhaps, God remains hopeful until the very end that even the evilest among us will repent and be saved.